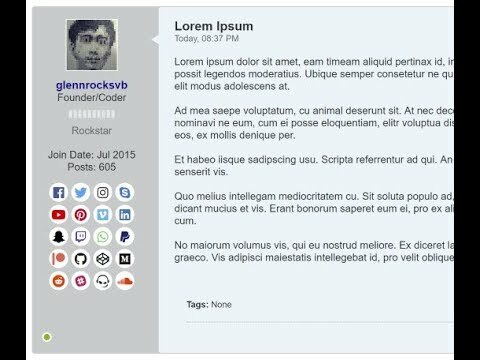 User Social Network Icons in Postbit - vBulletin Mods That Rock! Uses existing Profile Fields feature to enable users to fill out the social network profile links in their User Settings. Profile fields not set by users will not show up in postbit. Uses Font Awesome icons, the most popular font and icon toolkit based on CSS. Uses Product XML to install this mod. No editing of templates or source code necessary. Please see my postbit on this site. If you are a member of this forum, you could add your own social networks in your User Setttings and they will show up in your postbit. I should know not to ask this, but do you have anything like this for cloud users? Thanks for your interest Mitch. It's better to ask than not asking and not knowing what's possible for vBCloud. Installed....... by Glenn... perfect... ROCKS! Could this work say for just one user’s postbit or a couple admins on cloud without sacrificing performance? I could add a usergroup option to allow only certain usergroups to have this on their postbit. Hey Glenn, I would like to echo the request that it would be nice to have this with a usergroup option so we can select which user groups can take advantage of this. Then something like this would make sense to purchase for sure. Thanks for your suggestion. I will look into it.